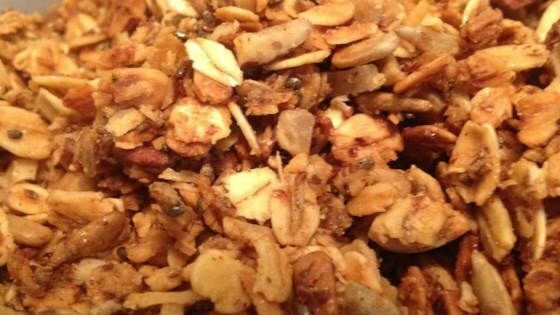 "This is a granola recipe fortified with wheat germ and flax seed that still tastes good." In a large bowl, mix together the oats, wheat germ, flax seed meal, brown sugar, sunflower seeds, pecans, almonds, cinnamon and salt. In a separate bowl, whisk together the oil, honey, vanilla and water. Pour the wet ingredients over the dry, and mix until evenly blended. Spread in a greased 9x13 or 11x7 inch baking pan. Bake for 1 hour in the preheated oven, stirring every 20 minutes, or until toasted. Let cool completely before storing in an airtight container. Too much salt, not much other flavoring. After I baked it, I mixed more honey, vanilla and cinnamon and remixed and baked.